In remembrance of the death of General José de San Martín 158 years ago, a Buenos Aires city legislature representative has proposed moving the remains, which lie in the cathedral of Buenos Aires, to Recoleta Cemetery. Meanwhile, numerous acts throughout the country evoked the memory of the Liberator. Official commemoration services by the national government were held in the Granaderos Horse Guard Regiment in Palermo and were presided over by the Minister of Defense, Nilda Garré, as reported on page 9. The project of representative Roy Cortina, President of the city’s Socialist Party, suggests locating the mausoleum with the Liberator’s remains—for which a public design & construction contest open to national artists would be called—in front of the main entrance of Recoleta Cemetery, near the tomb of Remedios de Escalada de San Martín. The initiative, which must be debated in the city legislature, proposes that the transfer take place on July 9th, 2010, as part of the Bicentennial celebrations. “The will of San Martín deserves to be respected & the place for his remains should be grandiose… in accordance with the place that we have given him in our hearts & in our nation,” expresses Roy Cortina concerning the basis of the project. The remains of the Liberator rest in the chapel of Our Lady of Peace, inside the Metropolitan Cathedral since 1880, permanently guarded by two Granaderos (the first Argentine regiment, created by San Martín). “The transfer of his remains makes sense based on respecting the will of General San Martín himself, who requested that his heart lie in the Buenos Aires cemetery. Furthermore, without denying the quality of the sculpture of the [current] mausoleum, it sits practically hidden on one side of Metropolitan Cathedral in a space inappropriate with the greatness & importance he has for all Argentines. Historical concensus recognizes [him] as the Father of our country,” explains Cortina in a press release. 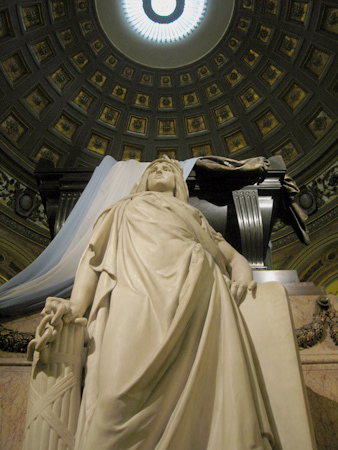 In the project proposal, the Socialista legislator points out that placement of the Liberator’s remains in the cathedral “was always controversial” and that, on Jan 3rd 1844, in Paris, San Martín dictated his third testament in which he expresses his desire to be taken after his death to Recoleta Cemetery. Original article in Spanish located here. José de San Martín died in Boulogne-sur-Mer in 1850, 28 years after the opening of Recoleta Cemetery. But the statement in his last will & testament is rather vague… at the time of his death, Recoleta Cemetery was the only public burial ground in the city. However a large number of burials were still taking place inside local churches (even though the practice had been offically prohibited by law). Among the most respected was the camposanto of the cathedral. So without mentioning a specific cemetery or church burial site, no one can truly know where San Martín actually meant to be buried. Argentines love to move their deceased leaders, but the current tomb of San Martín (above photo) is beautiful & completely in line with his historical importance. And the location could not be better. Plaza de Mayo is the most important public space in the nation, in spite of its current run-down condition. Several other more important city projects need to be resolved… no need to add another to the list. Let the Founding Father rest in peace.